This recording, made in the architecturally and acoustically glorious setting of the Lady Chapel of Ely Cathedral by the twenty-eight mixed voices of the Cambridge Singers, gathers together twenty-one examples of the extraordinary wealth of choral music inspired by the Virgin Mary, from Gregorian chant to the 20th-century sounds of Gustav Holst, Herbert Howells, Pierre Villette, Igor Stravinsky, Giles Swayne and John Tavener. The four antiphons of the Blessed Virgin Mary have been described as ‘among the most beautiful creations of the late Middle Ages’ (Apel, Gregorian chant, p. 404). The Alma redemptoris mater and Salve regina were formerly ascribed to the lame monk Hermannus Contractus (1013–54), but it is now accepted that all four were composed between the eleventh and thirteenth centuries, the anonymous work of monks or nuns in whose communities they adorned the daily worship and marked out the times and seasons. Despite being called antiphons, these four unusually extended and melodious chants were not sung in conjunction with psalms or canticles but were used to bring the daily Offices, especially Vespers and Compline, to a close. The Alma was sung from Advent to Candlemas, the Ave regina caelorum from Candlemas to Holy Week, Regina caeli laetare from the Eve of Easter Day to the week after Pentecost, and the Salve regina from then till Advent. During his lifetime and for at least 200 years after his death, Francisco Guerrero was one of the most widely published and performed vocal composers of the Spanish Renaissance, second only to Victoria in reputation. From 1551 until his death he worked at Seville Cathedral, first as assistant director of music, then from 1574 as director. He travelled widely, and had his music published in several countries; it was much performed in the Spanish-American colonies. He wrote mainly vocal music, sacred and secular. Among his 150 or so published motets, Ave virgo sanctissima (1566) enjoyed exceptional popularity. In fact it is slightly unusual among Guerrero’s motets, its two top voice parts (placed left and right on this recording) being in strict canon throughout, the second exactly echoing the first at two bars’ distance. The fifteenth-century musical manuscript containing this jewel among early English carols is in the form of a vellum roll more than six feet long, also containing other carols and mass settings. It was presented to Trinity College, Cambridge, in 1838, and has been transcribed and published several times since then; its text is attractive enough in its own right to have been newly set to music by a number of composers, including Benjamin Britten in his Ceremony of Carols. Victoria has long been regarded as the greatest Spanish Renaissance composer, despite being both less prolific and less versatile than many of his contemporaries: virtually his entire output, all of it Latin church music, is contained in only eight volumes. He began his musical life as a choirboy at Avila Cathedral, then moved to Rome as a student and, later, director of music, at the Jesuit Collegio Germanico where he remained till about 1586, taking holy orders in 1575. Despite growing European fame from his published compositions, he then returned to Spain to take up the cloistered post offered to him by Philip II as choirmaster and later organist of a convent in Madrid where he remained until his death. Among his works are numerous settings of Marian texts. This charming four-voiced Ave Maria is probably one of his most-performed pieces, though doubts have been cast on its authenticity as it was never published in the composer’s lifetime and is known only from a nineteenth-century edition. Richard Dering stands apart from the illustrious group of English composers active at the end of the sixteenth and start of the seventeenth centuries, by reason of exile. He is believed to have studied in England (he applied for an Oxford B.Mus degree in 1610), but in the increasingly anti-Catholic climate of the time, he, like a number of other English Catholics, decided to live abroad. By 1617 he was organist to the convent of English nuns in Brussels, and in that year published his first collection of Cantiones sacrae, from which this graceful motet is taken. Its simple, vivid expression of the text, without much contrapuntal elaboration, shows the influence of the new Italian Baroque style which Dering’s compatriots in England were perhaps slower to embrace. The text of the Stabat mater, with its gory imagery reminiscent of the 18th-century Pietistic verse uncomplainingly set to music by Bach in his cantatas and Passions, may be rather alien to present-day tastes; but its subject-matter, springing from a mother’s grief at the violent death of her son, is both human and timeless. It found a place in the Catholic liturgy from the fifteenth century, and there are numerous musical settings. Palestrina’s setting for double choir reputedly dates from 1589 or 1590, by which time the sexagenarian composer, then working as choirmaster of the Cappella Giulia at St Peter’s in Rome, was revered as the greatest master of polyphonic composition in Europe. A certain amount of mystique soon attached itself to his Stabat mater: according to legend, the manuscript was presented by the composer to the Sistine Chapel Choir for its exclusive performance every Good Friday, and the piece was never heard elsewhere until the English musician Charles Burney bribed a singer to show him a copy, which led to publication in England in 1771. In the nineteenth century, the composer Wagner published an edition replete with Romantic expression marks of his own. In fact, the Stabat mater is not very typical of Palestrina’s normal technique of composition, where relatively short sections of text are stretched a long way in music by means of imitative counterpoint, every voice part having a turn with the melody. The text of the Stabat mater is long, forcing Palestrina to deal with it more concisely than usual, with interest and variety coming from the contrasts and interplay of voices and textures available in the double choir medium. The result is a kind of dramatic fresco in music, filled with light and shade, an acknowledged masterpiece of Renaissance choral writing. Born to a devout Austrian family, the son of an organist and a distinguished organist himself, Bruckner not unexpectedly wrote a significant amount of sacred choral music. The present Ave Maria (one of three settings he made of the text) was written in 1861 while the composer was organist of Linz Cathedral, and it marked the end of a period of contrapuntal studies during which Bruckner was forbidden by his teacher Sechter to write ‘free’ compositions. Released from the ban, his creativity flowered in this simple but powerful motet, rooted clearly in the Viennese tradition but pointing towards Bruckner’s symphonic achievements to come. Around 1890, between the composition of his two final operas Otello and Falstaff, Verdi made this setting of lines from the Paradise canto of The Divine Comedy. He had recently written an Ave Maria, and was soon to compose a Stabat mater and a Te Deum which, between them, made up his swansong, the Four sacred pieces, first performed as a set in 1898. The Laudi, simple and chaste in expression, was written for four solo voices, but is more usually—and possibly more effectively—performed chorally. In 1926 Stravinsky rejoined the Russian Orthodox church, from which he had been estranged for some time. The main musical fruit of his reconversion was the Symphony of Psalms, but he also wrote three short unaccompanied sacred choruses, of which the Ave Maria (1934) was the last. Originally in Slavonic, it was adapted by the composer to the Latin text in 1949. Although choral music did not figure largely in Tchaikovsky’s output, he contributed to the repertory of the Russian Orthodox church with a small number of characteristic works, the most substantial being his setting of the Liturgy of St John Chrysostom of 1879. Soon after this he wrote nine sacred pieces for unaccompanied mixed chorus, of which Dostoino Yest (1884) is No 5. Its mood is reverent, its texture sonorous, revealing on a small scale Tchaikovsky’s all-too-little exercised mastery of the choral medium. During his tenure of office at the then very new Roman Catholic cathedral at Westminster, R. R. Terry actively encouraged composers to write for his much admired cathedral choir. In 1914 Howells, then a composition pupil of Stanford at the Royal College of Music, was recommended by him to Terry, and in that year Howells wrote a Nunc dimittis for Terry’s choir. Two years later he wrote them four ‘Anthems of the Blessed Virgin Mary’, of which the Regina caeli was the third. The anthems were not published at the time, and were forgotten for many years until rediscovery of a manuscript copy led to publication in 1988. Richly laid out for double choir, the music is perfectly calculated for the very reverberant acoustic of the cathedral: after a fanfare-like opening filled with Easter joy, there follows a blazing climax on the words ‘resurrexit sicut dixit’, then the music subsides to a peaceful conclusion, entirely appropriately since the anthem would have been sung at the end of Compline, the final evening office of Easter Day. Pierre Villette’s life in music was divided between composition, teaching and musical administration; until 1990 he was director of the Darius Milhaud Conservatoire in Aix-en-Provence. Like his older contemporary Duruflé, his compositional output was small but fastidiously crafted, with a variety of choral music amongst it. Hymne à la Vierge (1954) is one of a set of seven unaccompanied motets, clearly related to the sound-world of Poulenc, yet with a melodic charm and harmonic piquancy all its own. Among the generation of English composers to emerge in the 1970s, Giles Swayne must be reckoned one of the most individual. Early studies at Cambridge with Nicholas Maw, later lessons with Harrison Birtwistle and Alan Bush, visits to Messiaen’s composition class in Paris and time spent in Africa studying its traditional musics have nourished a wide-ranging musical imagination. Among his choral pieces, the Magnificat (1982) is one of the earliest to be influenced by African music: the rumbustious melody heard at the opening is based on a Jola ploughing-song from Senegal. The music then quickly develops into a kaleidoscopic mosaic of sound, built up very effectively for double choir from simple, detached fragments of melody, eventually coming to rest on a single high A for solo soprano. This expansive motet, published in 1572, shows Victoria’s writing at its sunniest. The (literally) flowery text, its imagery recalling the Song of Songs and the Classical myth of Aphrodite rising from the waters, inspired the composer to a quite ‘secular’ madrigalian setting, with effective use of contrasts between high and low groups of voices, some word-painting here and there, and a clear-cut structure with recurring refrain-like sections inserted, one suspects, more to catch the ear than to inspire devotion. In 1900 when Holst wrote this soaring, radiant piece for women’s choir, he had not long completed his studies at the Royal College of Music in London, and was earning a meagre living as a trombonist in a touring opera orchestra. It was the first of his compositions to attract public attention, being commended by the Times critic as ‘scholarly’, and earning the approval of Holst’s lifelong friend Vaughan Williams. Stanford, one of Holst’s former teachers, might well have been impressed by its flowing, melodious lines so skilfully interwoven, closely similar in style to Stanford’s own Beati quorum via written five years later. Victoria seems to have been especially proud of this spacious and impressive motet for double choir: originally published in 1572, it was reissued by him in later publications of 1576, 1585 and 1600, perhaps in response to public demand. It makes an interesting contrast to his four-part setting of the same text: less intimate and devotional, perhaps, but richer and more sonorous, fit to take its place in a cathedral’s celebrations of a great Marian feast day. Its sectional structure (with a characteristic triple-time passage) perhaps even points towards the Venetian splendours of Gabrieli. 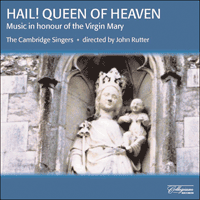 This recording, made in the architecturally and acoustically glorious setting of the Lady Chapel of Ely Cathedral by the twenty-eight unaccompanied mixed voices of the Cambridge Singers, gathers together twenty-one examples of the extraordinary wealth of choral music inspired by the Virgin Mary. Ever since the early centuries of Christian history, the Virgin Mary has played a significant role in worship. At the Council of Ephesus in 431 she was accorded the title of Mother of God, worthy of veneration above all other saints, and feast days dedicated to her began to appear in the church calendar, the most important being the Annunciation, the Nativity and the Assumption. The musical implications of this are clear: feasts call for specially elaborate music, and so a repertory of Marian music began to develop, especially in monastic institutions, where up to eight acts of worship were held each day. Prominent in this repertory are the four beautiful Antiphons of the Blessed Virgin Mary which frame this recording. These were composed in the turbulent centuries of the Crusades, the ending of which in 1291 marked the start of a period of especially intense devotion to Mary, perhaps in reaction to the violence and bloodshed that had gone before. The building of Lady Chapels in cathedrals and other churches was a notable symbol of this—nowhere more so than at Ely, whose huge and impressive Lady Chapel is virtually a separate structure from the main cathedral, its interior walls covered with stone carvings depicting the life and miracles of the Virgin. Mary became a popular subject of paintings and poetry, often being likened to a rose (an image going back to the Rose of Jericho in Ecclesiasticus); the delicately lovely English carol There is no rose of such virtue exemplifies this facet of Marianism at its height in the fifteenth century. In England, of course, all this changed with the Reformation, when the singing of Marian music and veneration of the image of any saint was brought to an end, although the 1549 Book of Common Prayer did retain the principal feast days of Mary. In Italy and Spain, however, the Reformation had the effect of redoubling Catholic fervour, with the Jesuit order being founded in 1534 and the Council of Trent (1545–63) defining Catholic doctrine and reforming its practice. The church music of Victoria and Guerrero typifies this spirit of Counter-Reformation; and it is easy to see a work like Palestrina’s Stabat Mater as a musical counterpart to the great Renaissance pietàs which made real to the beholder the human grief of Mary at the Cross. If the influence of the Reformation on the Catholic church was at least partly negative and reactionary, as far as the Orthodox church is concerned it was wholly negligible: Tchaikovsky’s and Stravinsky’s short hymns to the Virgin remind us of a centuries-old tradition of worship in which she had always been profoundly venerated. In northern Europe, on the other hand, Mary went underground, and it was not until well after the Catholic emancipation of the nineteenth century (given artistic focus in England by the Oxford Movement) that such overtly Marian pieces as Holst’s Ave Maria, Wood’s Hail! Blessed Virgin Mary and Howells’s Regina caeli began to reappear. In Catholic countries, popular devotion to the Virgin was given new impetus by the miraculous apparitions of the nineteenth century (Villette’s Hymne à la Vierge would not be out of place at Lourdes), while in Protestant countries a more relaxed attitude to Mary has allowed such ‘Catholic’ (and cross-cultural) manifestations as Giles Swayne’s Latin Magnificat based on a Senegalese ploughing-song to take their place in the normally tranquil atmosphere of Anglican Evensong. Scholars, theologians, believers and non-believers will probably continue to debate the role and significance of the Virgin Mary until the end of time; but music-lovers are free simply to enjoy and be enriched by her marvellous legacy of music. Thus, the pieces heard on this recording, although grouped under four seasonal headings, do not in any sense form a strict liturgical sequence, nor are they ordered chronologically or by nationality. Rather, each piece could be thought of as an individual tile in a mosaic picture of the first-century woman of whom, really, we know so little but who has given inspiration and solace to so many. Cet enregistrement, créé dans le splendide cadre architectural et acoustique de la Chapelle Notre-Dame de la Cathédrale de Ely par les 28 voix mixtes non-accompagnées des Cambridge Singers, rassemble 21 exemples de la richesse de musique chorale extraordinaire inspirée par la Vierge Marie. Dès les premiers siècles de l’histoire chrétienne, la Vierge Marie a joué un rôle important dans la louange. Au Concile d’Ephèse en 413 on lui a accordé le titre de Mère de Dieu, digne de vénération au-dessus de tous les saints, et des jours de fête lui étant dédiés ont commencé à apparaître dans le calendrier de l'église, les principaux étant l'Annonciation, la Nativité et l'Assomption. Les implications musicales en sont claires: les fêtes exigent une musique spécialement élaborée, et donc un répertoire de musique dédiée à la Vierge Marie commença à se développer en particulier dans les institutions monastiques où il y avait jusque huit cultes par jour. La beauté des quatre Antiphones de la Sainte Vierge Marie tirés de ce répertoire et formant le cadre de cet enregistrement est frappante. Ceux-ci furent composés au cours des siècles turbulents des Croisades, dont la fin en 1291 marque le commencement d’une période d’intense dévotion à la Vierge Marie, peut-être en réaction à la violence et l’effusion de sang auxquelles elle faisait suite. La construction de Chapelles Notre-Dame dans les cathédrales et autres églises en est un symbole notable, nulle part ailleurs plus qu’à Ely, dont l’immense et imposante Chapelle Notre-Dame est pratiquement un édifice indépendant de l’ensemble de la cathédrale, ses murs intérieurs recouverts de sculptures de pierre représentant la vie et les miracles de la Vierge. Marie devint un sujet bien-aimé de peintures et de poésie, souvent comparée à la rose (image de la Rose de Jéricho tirée du livre de l’Ecclésiastique). There is no rose of such virtue, un charmant et délicat chant de Noël anglais est un exemple typique de cet aspect du culte de la Vierge Marie à son apogée pendant le 15ème siècle. En Angleterre, évidemment, tout ceci changea lors de la Réformation, qui entraîna la fin des chants dédiés à Marie et la suspension d’adoration d’images de tout saint, bien que le Livre de Prières Courantes de 1549 retint les jours de fête de la Vierge Marie. En Italie et en Espagne, par contre, la Réformation eut pour effet de redoubler la ferveur catholique, l’Ordre des Jésuites étant fondé en 1534 et le Concile de Trente (1545–63) définissant la doctrine catholique et réformant sa pratique. La musique d’Eglise de Victoria et Guerrero typifie cet esprit de Contre-Réformation; et il est facile de voir dans une œuvre telle le Stabat Mater de Palestrina la contrepartie musicale des grandes pietàs de la Renaissance qui rendaient vivant le chagrin humain de Marie à la Croix. Si l’influence de la Réformation sur l'Eglise Catholique fut tout au moins en partie négative et réactionnaire, elle fut tout à fait négligeable en ce qui concerne l’Eglise Orthodoxe: les courts hymnes à la Vierge de Tchaikowsky et Stravinsky nous rappellent une tradition d’adoration vieille de plusieurs siècles où Marie était toujours profondément vénérée. En Europe du Nord d’un autre côté, on n’entendit plus parler de la Vierge Marie et ce ne fut que bien après l’émancipation catholique du 19ème siècle (le Mouvement d’Oxford lui donnant un focus artistique en Angleterre) que des morceaux ouvertement dédiés à la Vierge Marie commencèrent à réapparaître tels l’Ave Maria de Holst, le Hail! Blessed Virgin Mary de Wood et le Regina caeli de Howells. Dans les pays catholiques, l’adoration populaire de la Vierge prit un nouvel élan avec les apparitions miraculeuses du 19ème siècle (l’Hymne à la Vierge de Villette ne serait pas déplacé à Lourdes). Tandis que l’attitude plus détendue des pays protestants envers Marie a permis à des manifestations “catholiques” (et multi-culturelles) telles que le Magnificat latin de Giles Swayne basé sur une chanson de laboureur du Sénégal de prendre part à l’atmosphère normalement paisible de l’office du soir anglican, l’evensong. Les savants, théologiens, croyants et non-croyants continueront peut-être de débattre le rôle et l’importance de la Vierge Marie jusqu’à la fin des temps; mais les mélomanes sont libres d’apprécier simplement et d'être enrichis par son merveilleux héritage de musique. Ainsi donc, les morceaux dans cet enregistrement, bien que regroupés sous quatre titres saisonniers, ne forment aucunement une stricte séquence liturgique et ne sont pas rangés par ordre chronologique ou par nationalité. Plus exactement, on pourrait s’imaginer que chaque morceau telle une dalle individuelle, fait partie d’une mosaïque représentant cette femme du 1er siècle sur qui nous ne savons pas grand-chose mais qui offrit à tant d’êtres inspiration et réconfort. Die vorliegende Aufnahme aus der sowohl architektonisch als auch akustisch prachtvollen Marienkapelle der Kathedrale von Ely enthält 21 Stücke, die in ihrer Gesamtheit das außerordentlich breite Spektrum an Chormusik zu Ehren der Jungfrau Maria zeigen. Gesungen werden die Werke ohne Begleitung vom 28köpfigen, gemischten Chor der Cambridge Singers. Schon früh in der Geschichte des Christentums hat die Jungfrau Maria stets eine wichtige Rolle gespielt. Auf dem Ökumenischen Konzil von Ephesus im Jahre 431 wurde Maria zur Mutter Gottes erklärt, die über allen Heiligen stand. Im Kirchenkalender tauchten bald Feiertage zu ihren Ehren auf, darunter als die wichtigsten Mariä Verkündigung, Mariä Geburt und Mariä Himmelfahrt. Die Konsequenzen, die sich daraus für die Musik ergaben, liegen auf der Hand: Feiertage verlangen nach besonders kunstvollen Kompositionen, und so entwickelte sich nach und nach ein Schatz an Werken zu Ehren Marias, der besonders in den klösterlichen Einrichtungen gepflegt wurde, wo man sich täglich bis zu acht Mal zu Gebet und Gesang versammelte. Herausragend sind dabei die vier herrlichen Wechselgesänge zu Ehren der Heiligen Jungfrau Maria, die den Rahmen dieser Aufnahme bilden. Sie entstanden in den unruhigen Jahrhunderten der Kreuzzüge, deren Ende im Jahre 1291 den Beginn einer Periode besonders inniger Hingabe an Maria markierte, vielleicht als Reaktion auf die blutigen kriegerischen Auseinandersetzungen in der Zeit davor. Der Bau von Marienkapellen in Kathedralen und anderen Kirchen war ein augenfälliges Symbol für diese Entwicklung, auch in Ely, dessen riesige und imposante Marienkapelle praktisch als eigenständige Struktur innerhalb des kirchlichen Gesamtbaus zu betrachten ist. Besonders hervorzuheben sind die Steinskulpturen an den Innenwänden der Kapelle, die das Leben Marias und die von ihr bewirkten Wunder darstellen. Auch in Malerei und Dichtung wurde Maria ein beliebtes Sujet, oft mit einer Rose verglichen, ein Bild, das auf die Rose von Jericho im Buch Jesus Sirach zurückging. Das liebliche englische Lied There is no rose of such virtue ist ein Paradebeispiel für diesen Aspekt der Marienverehrung auf ihrem Höhepunkt im 15. Jahrhundert. Mit der Reformation wurde in England schlagartig alles anders. Vorbei war es mit den Gesängen zu Ehren Marias und der Anbetung jedweden Heiligenbildes, auch wenn im Gebetbuch von 1549 die Hauptfeiertage der Muttergottes beibehalten wurden. In Italien und Spanien führte die Reformation natürlich dazu, daß dort die religiöse Inbrunst der Katholiken nur noch zunahm. Die Bestätigung des Jesuitenordens durch den Papst (1540) und das Trienter Konzil (1545–63), auf dem die Neuformulierung der katholischen Lehre vorgenommen wurde, fallen in diese Zeit. Die Kirchenmusik von Victoria und Guerrero ist typisch für den Geist der Gegenreformation. So ist ein Werk wie das Stabat Mater von Palestrina, dessen Stil übrigens auf dem Trientiner Konzil als offizielles Vorbild der katholischen Kirchenmusik anerkannt wurde, leicht als musikalisches Pendant zu den großen Pietas der Renaissance zu begreifen, aus denen die ganze Trauer Marias und damit des Menschen über den Tod Jesu am Kreuze zu uns spricht. War der Einfluß der Reformation auf die katholische Kirche zumindest zum Teil negativ und retardierend, so war er in der Ostkirche praktisch nicht zu spüren: Tschaikowskijs und Strawinskys kurze Hymnen an die Jungfrau Maria erinnern uns lebhaft an die jahrhundertealte Tradition der Marienverehrung in den Ländern des griechisch- und russisch-orthodoxen Glaubens. Im nördlichen Europa hingegen geriet Maria aus dem religiösen Blickfeld. Erst längere Zeit nach der Gleichberechtigung der Katholiken im England des 19. Jahrhunderts, die in der Oxford-Bewegung ihren künstlerischen Ausdruck fand, erschienen wieder Stücke expliziter Marienverehrung wie das Ave Maria von Holst, das Hail! Blessed Virgin Mary von Wood und Howells Regina caeli. In den katholischen Ländern erhielt die volkstümliche Verehrung der Muttergottes zur selben Zeit erneuten Auftrieb durch die Marienerscheinungen (Villettes Hymne à la Vierge zum Beispiel würde durchaus nach Lourdes passen). In den protestantischen Ländern wiederum war es dank einer entspannteren Haltung zu Maria nunmehr möglich, daß auch so “katholische” und transkulturelle Manifestationen der Marienverehrung wie das lateinische Magnificat von Giles Swayne, das auf einem beim Pflügen gesungenen Lied aus Senegal basiert, einen Platz in der normalerweise betont ruhigen Atmosphäre der anglikanischen Abendandacht gefunden haben. Gelehrte und Theologen, Gläubige und Nichtgläubige werden wohl auch weiterhin und bis ans Ende aller Zeiten Diskurse über die Rolle und die Bedeutung der Jungfrau Maria führen. Musikliebhaber hingegen können sich einfach an dem reichen Schatz der Musik, der zu Ehren der Muttergottes entstanden ist, erfreuen und von ihm bereichern lassen. So bilden die auf dieser Aufnahme vertretenen Stücke, selbst wenn sie unter vier Abschnitten des Kirchenkalenders zusammengefaßt sind, in keiner Weise eine strenge liturgische Reihenfolge. Auch chronologisch oder nach nationalen Gesichtspunkten sind sie nicht geordnet. Vielmehr ist jedes Stück als individuelles Steinchen im großen Mosaik des Bildes dieser einzigartigen Frau zu sehen, von der wir, genau betrachtet, so wenig wissen, die aber für so viele eine nie versiegende Quelle der Liebe und des Trostes ist.